Every writer in the former Yugoslavia used to be eligible for the SFERA Award. So there are, among the early winners, some Slovenian and Serbian genre writers. Today, SFERA is a national award (and no longer the only one!). I think almost all the other literary awards in ex-Yu have been either ceased or transmuted into national ones. This would probably not be relevant in any way if Croats, Serbians, Bosnians and Montenegrans were unable to read each other’s work without translation. But they are. So, basically for most writers of these now separate sovereign countries the market became that much smaller about a quarter of a century ago. All is, however, not lost. New awards have been established, regional ones. Baby steps, of course, so one of the first regional awards was in children’s literature, established ten years ago, in the third largest city of Bosnia and Hercegovina, Tuzla. Its name is Little Prince, it was founded by the Tuzlan publishing house „Bosanska rijec“ iz Tuzle and is given out annually at the 11th children’s festival Vezeni most. 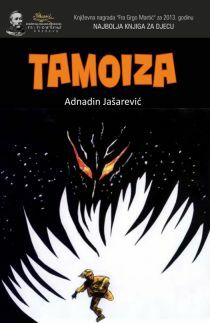 This year the coveted bronze statue of the famous character imagined by de Saint-Exupery and the 1 500 euro award have gone to my good friend, Adnadin Jašarevic for his first excursion into children’s lit for the fantasty book Tamo iza (“Behind there”). I am immensley proud and pleased, not only because he is my friend, but also because the best book, for kids, across the region was one that belongs to my favourite genre. Adnadin Jašarevic is the man who wrote the first epic fantasy novel in Bosnia and Hercegovina. I know him as the organizer of the Fantastic Literature Festivals in his hometown of Zenica. These have been the only thing akin to an SF convention held in B&H. Regardless, this Bosnian author is not a stranger to SF cons – he has been a member of almost all Croatian cons at one time or another in the past decade. And he has donated a signed genre story for GUFF! When not writing, Adnadin earns his living as a journalist and director of the Musem of Zenica. He has edited all the short story collections that accompanied the Fantastic Literature Festivals in Zenica and some that were published as part of the Fantastic Literature Festival in Montenegro. He has won other mainstream awards for his writing, but I should not be surprised if this one makes him the happiest.